late model blue, or black, Chevrolet Suburban that dropped the woman off. 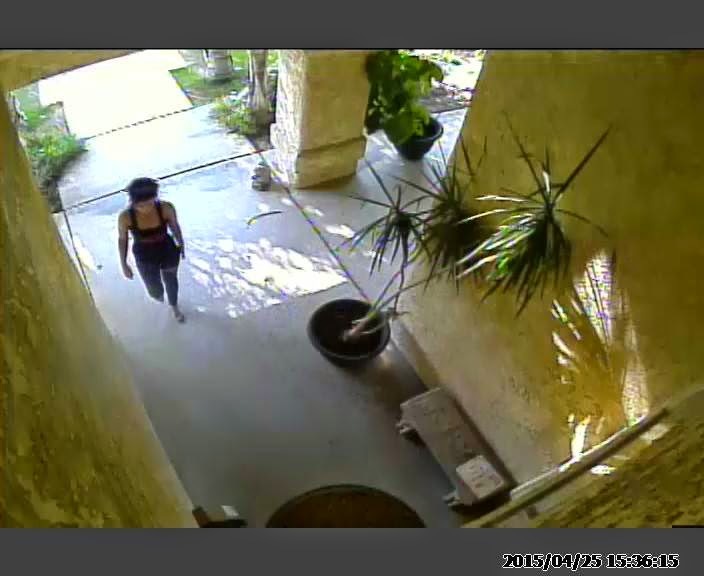 Absher has posted four videos of the theft on a Facebook page called "Bakersfield Dirtbag." Check it out and if you recognize the woman, contact Earl. * … GOOD FORM: There are good and honest people in this town, as this story from Steve Hollick testifies. "Richard, I went to Target in Rosedale. As I was loading my truck, I reached for my brand new iPhone and realized I didn't have it! I ran back into the store and retraced every step. Needless to say, it was gone. I was extremely upset with myself. A security guard was by the door and in a moment of desperation I just asked him if anyone turned it in. He gave me a big smile and said yes. I was stunned! I about hugged that guy! I want to thank the person who found and turned it in! God Bless him or her! I'm so glad that there are honest people in this town!" * … SPOTTED: I spotted this gem on Twitter: "Guys are like bears. If you lay very still they’ll paw at you a bit then give up and go look for food." * … MEA CULPA: I made an error earlier this week in writing about a home on Elm Street that had been taken over by squatters. The home, as it turns out, was not near 24th Street but instead is located closer to the Golden State Freeway. It is owned by a finance company and was not purchased by the city as part of the 24th Street Widening project. Squatters has become a problem throughout town, particularly when homes are in foreclosure or have been purchased by a governmnental authority as part of road projects. * … MAZE CUP: The Maze Cup, a tennis tournament featuring some of the top juniors from Northern and Southern California, is coming back to Stockdale Country Club this year. 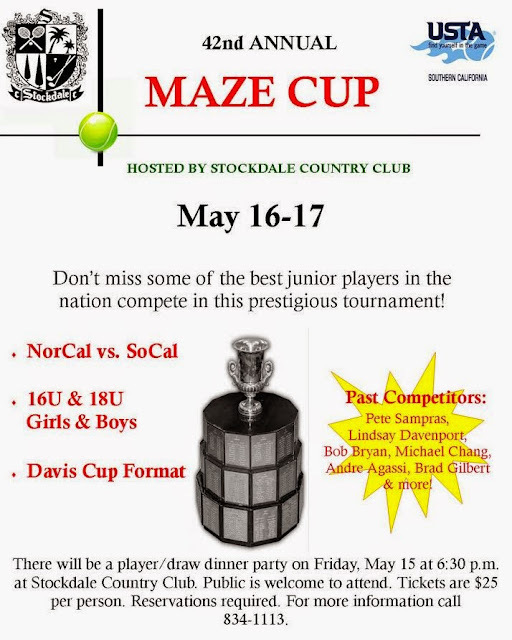 It is set for May 16-17 and trust me, this is one tournament you don't want to miss. Some of the past participants include Lindsay Davenport, Pete Sampras, Andre Agassi, Michael Chang and Bob Bryan. The cost to attend is $25 and reservations are required. Call (661) 834-1113. * … OLPH: If you are in the mood for one of the best steaks in town (and face it, who isn't?) consider the annual Our Lady of Perpetual Help spring barbecue on the Parish grounds, 124 Columbus Street this Thursday. This is the famous Harris Ranch New York steak or chicken with all the local trimmings for just $25. Gates open at 5 p.m. with dinner served from 5:30 p.m. to 8:30 p.m. Tickets are available at the church or school offices, at the event or by calling (661) 872-1543. Take out available as well as complimentary valet parking. of one memory. I don't know if it is a dream or real. I seem to remember a theater that had a "Spanish" motif interior with trellises down the sides. Maybe some reader can enlighten me if it was real or just in my mind. If it is a dream, it was beautiful."